Russian President Vladimir Putin is pictured at a meeting with students in Yaroslavl, Russia, Sept. 1, 2017. Putin said that whoever reaches a breakthrough in developing artificial intelligence will come to dominate the world. The digital arms race between the United States and Russia appears to be accelerating, fueled in part by new comments by Russian President Vladimir Putin. Putin, speaking to a group of Russian students Friday, called artificial intelligence "not only Russia's future" but "the future of the whole of mankind." "The one who becomes the leader in this sphere will be the ruler of the world," he said. "There are colossal opportunities and threats that are difficult to predict now." Top U.S. intelligence officials have been warning of a "perpetual contest" between the United States and Russia, with much of it playing out in the digital domain. "They've got their heads wrapped around the idea that 21st century warfare is as much cognitive as it is kinetic," outgoing DIA Director Lt. Gen. Vincent Stewart told a small group of reporters from VOA and other organizations last month. But some analysts see Putin's willingness to address the issue publicly as telling. "[It's] rare that you have a head of state discussing these issues," said Frank Cilluffo, director of the Center for Cyber and Homeland Security at George Washington University. "He is sending a message." "A big space race is on, and it's a race we can't afford to lose," he said. "It completely changes the game of warfare," said David Kennedy, who served with the U.S. National Security Agency and with the Marine Corps' electronic warfare unit. "It's no longer going to be about who has the most bombs or who has the better bombs," he said. "It's going to be who can apply these principles to respond faster to fight a war and win a war." 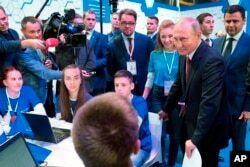 Russian President Vladimir Putin meets with students in Yaroslavl, Russia, Sept. 1, 2017. Putin said the development of artificial intelligence raises "colossal opportunities and threats that are difficult to predict now." "They explore all options, and they have a substantial budget for it," he said, noting that Moscow may have an advantage in how to apply the technology since it is willing to sidestep privacy and ethical concerns that the U.S. and even China have tried to address. It is seen as a potentially game-changing tool for intelligence agencies, enabling them to hack encrypted messages from their adversaries while their own communications would be "hackproof," if the technology can be perfected. "The Chinese have one of the most powerful quantum encryption capabilities in the world," DIA's Stewart cautioned last month. "Whoever wins this space wins the game."